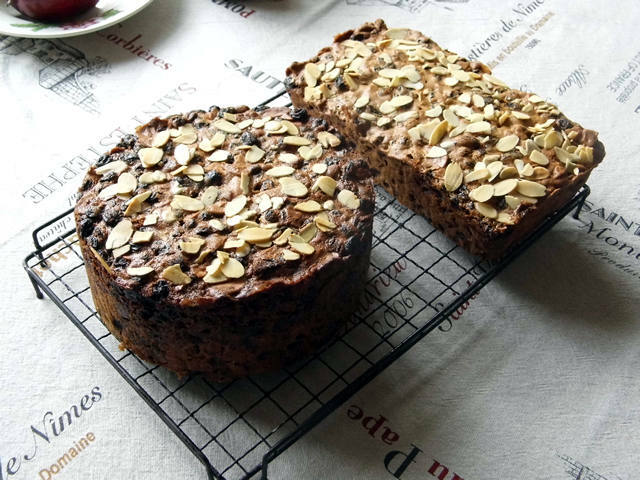 I have been making Christmas cakes for the past forty one years and I have tried a few recipes but this particular one is our favourite. The recipe is adapted from a 1972 Family Circle magazine. 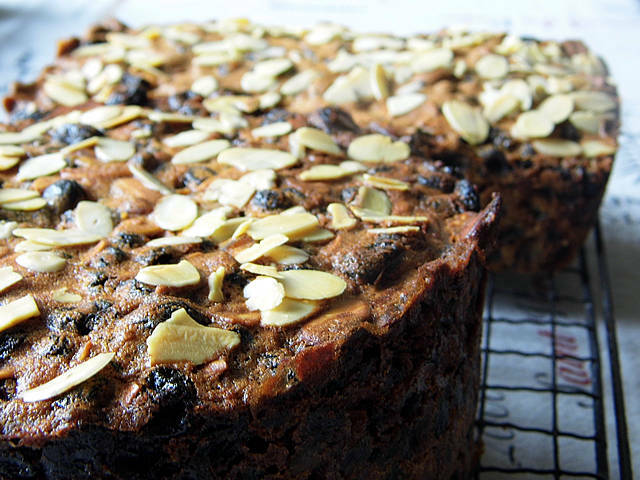 For a Christmas Cake always make the cake at the end of September. By adding brandy or cognac to the cake at intervals you are guaranteed a gorgeous moist and flavoursome cake for Christmas. Prepare a moderately hot oven (400degF gas 6). Grease a cake tin and line with a double thickness of greaseproof paper. Brush paper with melted butter. Cut a double strip of brown paper or newspaper, one inch higher than the depth of the tin; place around the outside of the tin and secure with string. Cream the butter or margarine together in a mixer until light and fluffy. Add the beaten eggs, a little at a time and stir in the lemon rind. Add fruit, almonds and citrus peel and mix well. Stir in the flour, mixed spice and the lemon juice. Mix well and then place into the tin, pressing the mixture down the sides. Level top with the back of the spoon. Place the cake tin onto a double sheet of brown paper on a baking tray. Reduce the oven to cool 325degF, gas 3, place the cake tin in the centre of the oven and cook for one hour. For the second hour reduce to 300degF gas 2. For the third hour reduce to 275degF gas 1. If not sufficiently brown after three hours, cook for a 4th hour at 275 deg F gas 1. When sufficiently brown place a piece of brown paper on the top of the cake and cook for a further one hour, testing to see if cooked at intervals of thirty minutes. Test by pressing with the fingers on the top of the cake. If cooked the cake should spring back and have begun to shrink from the sides of the tin. Remove from the oven and leave to cool inside the tin. When cool, remove cake from the tin and peel off the paper. To increase keeping time of the cake and to ensure moistness, prick cake over the top with a skewer and spoon in the brandy. Turn the cake upside down and treat the base similarly. Wrap the cake in cling film and store in a cake tin or large plastic container. Repeat pricking and adding brandy twice or three times more at monthly intervals.